Some days you just can't wake up. You hit the snooze button a few times but just can't bear the thought of getting out of bed. Today was not one of those days. I had been waking up hourly since about 4am waiting for my alarm to go off. It was a mixture of excitement and nervousness, like applying for a new job. 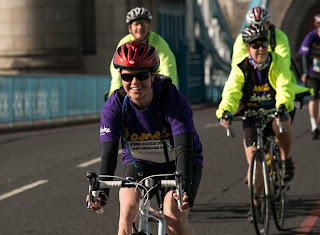 Today was my first long distance bike ride, the Thames Bridges Bike Ride. To top it off, I do not have joy joy feelings of cycling in London. It seems weekly a cyclist is getting injured, and although I have had some practice out on the roads, I still was not too confident. The day however, was perfect. Blue skies and a dabbling of happy clouds, it was hard to feel nervous on such a beautiful day. I showed up to Southwark Park and started off, grateful the ride was on a Sunday and not many cars were out and about. After remembering to turn on my Garmin (*face palm*), I went over Tower Bridge, where my fiancee was snapping photos a la paparazzi of me. I smiled and continued on... hopefully I would see him soon at the finish line! It really angers me when cyclists do not follow the rules of the road. To be fair motorists do it too, generally as a result of experience and thinking 'whats the harm?' so that is probably the same mentality of cyclists; but considering how many accidents occur in London I was surprised to see as many road violations as I did by cyclists. I am sure I broke one or two too... a few times I felt like I was "just pulling in front of" cars due to not knowing which lane to be in. However, turning left on a red? Come on! Once we got out of London proper was when I felt I was really able to speed up. It was wonderful to see all the activity along the Thames, with a lovely breeze and the sun still blazing away. I enjoyed watching the rowers in formation, and all the dogs playing merrily on the banks. Richmond Park had the toughest hill on the course, but was not nearly as bad as the hills in the New Forest. However, by then I was in the mid-upper 20 mile range by then, and my legs were not in a happy place. Thanks goodness for my Camelback.. and then going downhill! The last few miles were gloriously traffic free, giving me time to look around and more or less amble to the finish right across Hampton Court Bridge, where Tom was ready to take more photos of me getting my finishing medal. 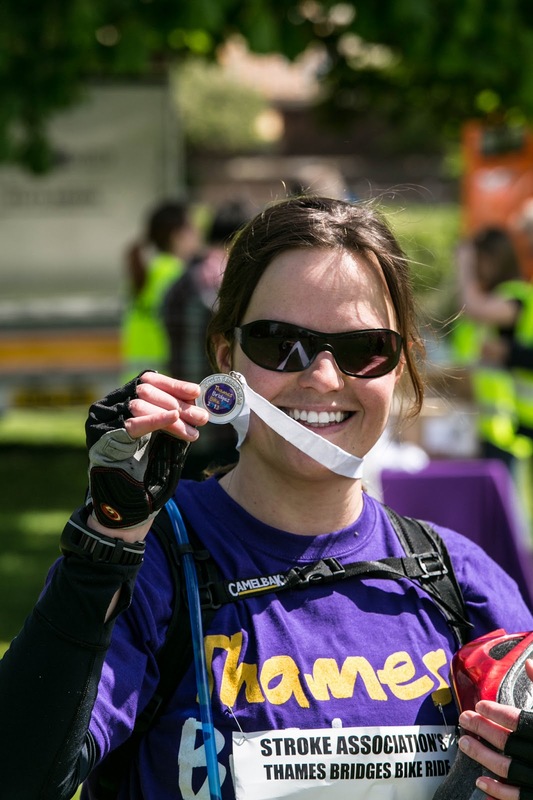 You can still donate to the Stroke Association at my JustGiving page... thanks to everyone who donated, you have helped countless others with your generosity! Food is truly a wonderful motivator. Nice weather helps too. I finally convinced myself to go for a quick cycle ride during lunch today. I felt stupid having my socks over my right pant leg, but kept telling myself its better than getting jeans stuck in gears on a busy road. This being my first time on my new bike on the road, I decided to not clip in. View I had for lunch... perfect! In short: I did not die, AND I got a tasty lunch at the Mayflower, a cosy pub along the Thames with nice outdoor seating! I even whipped out the laptop to do some work over since the day was shaping up to be so nice (and here I thought it was supposed to rain, but to be fair its expected in London). It was actually quite hard to find a place to stick the bike, but I found a good spot eventually, and worried about the bike being nicked most of lunch. My pride of the ride was successfully navigating a roundabout-- with no one honking or a bus veering down on me. I was even able to cycle up (down? I guess its a perspective thing) Tooley Street to drop by Evans Cycles to figure out my gear issue (hint: it was a user error). That street, is -TIGHT-. Not in a good way. And the pedestrians just waking into the street without caring that they are not supposed to go (rote mann!kein grüne mann!) I shudder when I think about Trafalgar Square or anywhere near Covent Garden... maybe with time! Ha. This ride was not about distance, it was about getting out there on the London roads with the bike to get comfortable with the gears and handling. Getting some sun and exercise was just a happy side affect :) 5.84 miles down.